What's in a name? For one little girl, her very long name tells the vibrant story of where she came from––and who she may one day be. If you ask her, Alma Sofia Esperanza José Pura Candela has way too many names: six. How did such a small person wind up with such a large name? 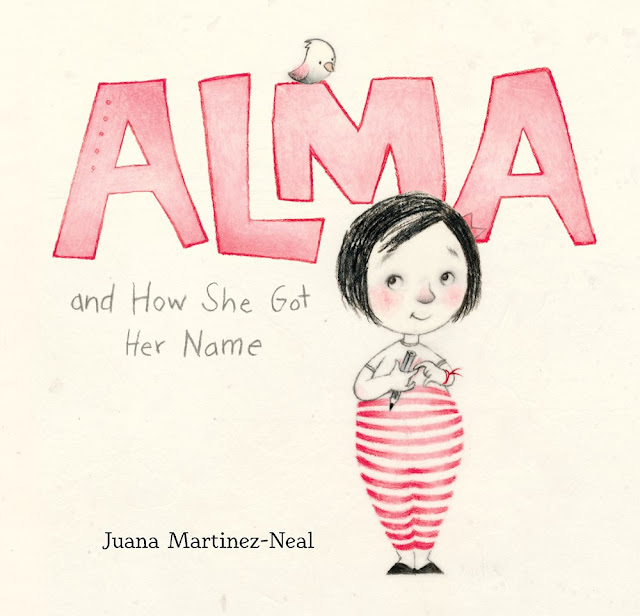 Alma turns to Daddy for an answer and learns of Sofia, the grandmother who loved books and flowers; Esperanza, the great-grandmother who longed to travel; José, the grandfather who was an artist; and other namesakes, too. As she hears the story of her name, Alma starts to think it might be a perfect fit after all––and realizes that she will one day have her own story to tell. LTPB: I understand this book is semi-autobiographical! 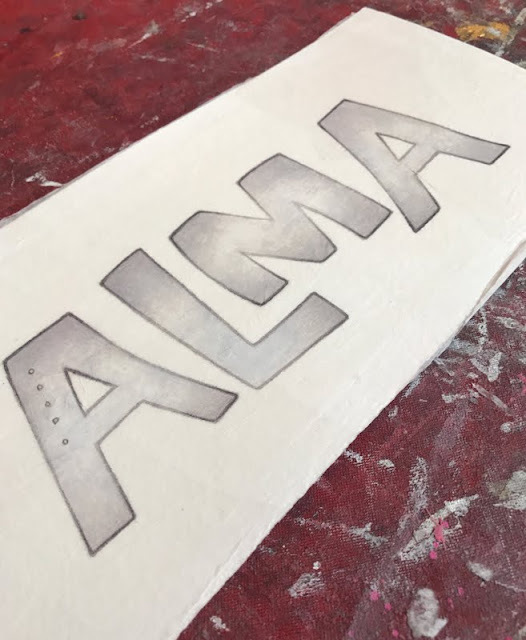 What was the impetus for creating Alma? As this is a more personal story, how long did you work on it before you decided it was ready to submit? JMN: The story of Alma started as a story about how I was named when I was born in Peru. Little by little it evolved into the story it is today. To start, I began looking for the right character. One day a sketch of a little girl just happened. I drew my grandma next to her and started jotting down different names next to them. Alma as the idea of the book that it is now started that day. While this idea for my story was still shaping in my mind, I met my literary agent, Stefanie Von Borstel of Full Circle Literary. Together we began brainstorming about other name stories, including her son’s name story. Every name has a story behind it! 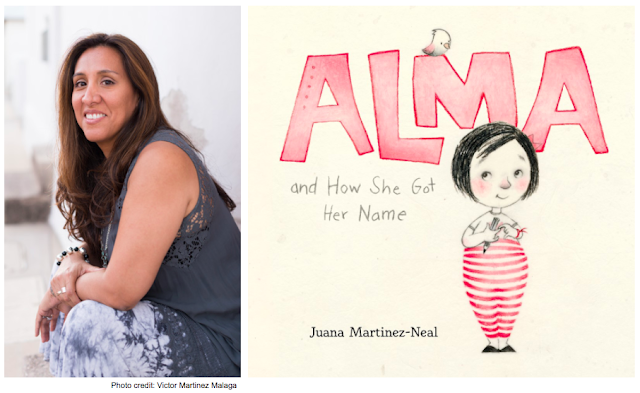 From there, Alma, began to grow from a story about my name to a story that inspires children to learn about their own name and who they are. 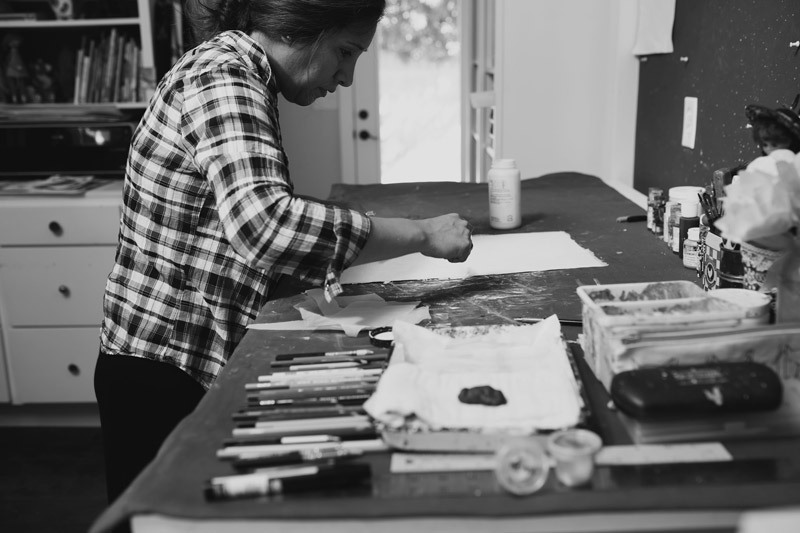 Every time I got stuck (and it happened a few times), Stefanie set me back on track and got me back to working step-by-step until we were ready for submission. Once the book went on submission, I was pleasantly surprised at the amazing response from publishers when we received multiple offers. The idea for the book first came to my mind in 2011. I would have never guessed that the book would go through so many changes and would become the book that it is now. I am so happy that it is now out in the world! JMN: I really enjoy drawing people, and all of these upcoming books focus on people and their unique personalities. When I receive a manuscript, I need to “see” the characters with their moods and quirks in my head right away. Once it is time to paint each spread, I try to tweak my technique slightly for each book. LTPB: Can you talk a little bit about how you created the custom fonts in this book? How do you go about creating these different styles of text to match each new character? JMN: Typography. I l-o-v-e typography. Working on my first author-illustrator picture book was the perfect opportunity for me to use my fascination with type and hand-lettering. Once I had the character sketches, I envisioned a name to go with each personality that gives you a sense of who they are. Then, I carefully choose the lettering that would communicate the personality as well. For example, Esperanza means hope. In the story, Esperanza wanted to travel. 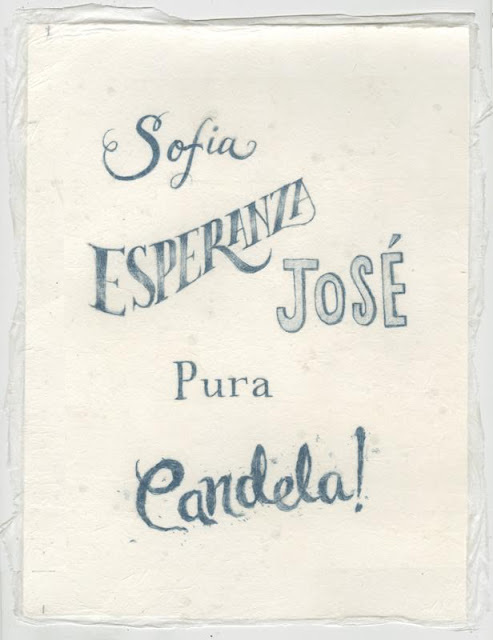 Esperanza’s type had to have some movement, since she longed for movement herself. JMN: For Alma, I worked on heavyweight paper with colored pencils and graphite. I also transferred sketches, and added colored pencils and graphite to the transfers. This was the first time working this way so there was lots of experimenting in the first few pieces. LTPB: You’re basically on fire right now with lots of books coming out! What are you working on now? Anything you can show us? JMN: That’s very kind of you, thank you! Some of my next picture books are Swashby and the Sea written by Beth Ferry (Houghton Mifflin Harcourt 2020) and Babymoon written by Hayley Barrett (Candlewick 2019), where I am going back to a mixed media process with colored pencils, acrylics and graphite on paper. I’ll have to let Candlewick be the one to share those images and the cover, yet it is coming in Spring 2019 so it will be soon! JMN: I think Isabelle Arsenault or Rebecca Dautremer as they would have this way of making even ordinary stories look grandiose and interesting. A million thanks to Juana for taking time to answer some questions! Alma and How She Got Her Name publishes TODAY from Candlewick in both English and Spanish! Special thanks to Juana and Candlewick for use of these images!